T-Mobile has started selling the Dash, a slim Windows Mobile smartphone that was announced earlier this month. The Dash is slightly thinner than the Motorola Q which qualifies it as the thinnest Windows Mobile handset in the world. 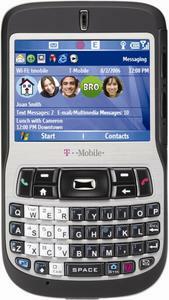 Like many other Windows Mobile phones, the Dash is manufactured by HTC. Interestingly enough, T-Mobile is targeting consumers with this device and not business users. Compact profile, just 4.4" by 2.5" by .51"
T-Mobile is selling the Dash for $199 after a $50 mail-in rebate and a 2-year service contract. It's available now. Verizon Wireless recently added a $100 rebate to the Motorola Q, bringing its final price down to $99.